Last Monday 25th March we highlighted Euro vulnerability here previously driven lower by very weak German Purchasing Managers’ Index data. This weakness has continued in late March with dovish comments from European Central Bank members and the ongoing weakening of economic data across the Eurozone. Furthermore, the US Dollar has seen broader strength through latter March and into early April, despite a shift to a more “risk on” phase, with global equity markets setting a more positive tone. 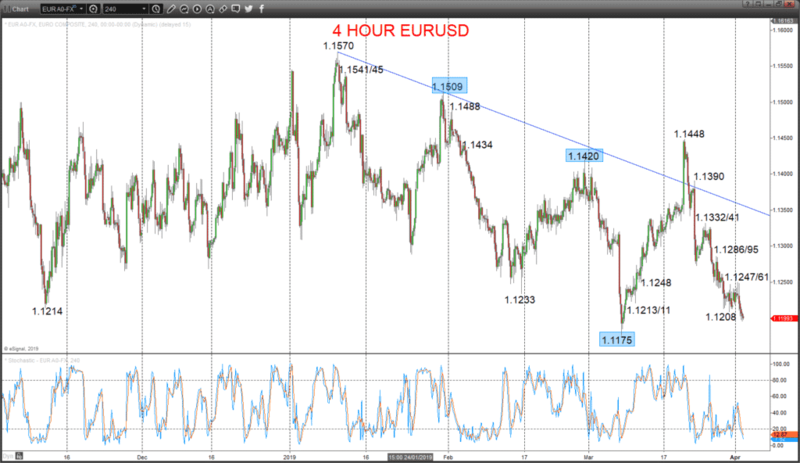 This combination of a weakening Euro and firming US$ leaves EURUSD risks to downside and aims at the 2019 low at 1.175 into early April, as we look at below. A Monday failure back lower from within our 1.1247/61 resistance area (from 1.1250), to push below 1.1213/08 supports, sustaining bear pressures from the aggressive March selloffs down from 1.1448 and 1.1390, to keep risks lower for Tuesday. The latter March surge post-Fed Meeting above 1.1420 set a broader range we see as 1.1509 to 1.1175, BUT with risks skewed towards an intermediate-term bearish shift through 1.1175. We see a downside bias through 1.1195; break here aims for key 1.1175 and maybe towards 1.1144. But above 1.1247/61 aims for 1.1286/95 and maybe 1.1332/41. Intermediate-term Range Breakout Parameters: Range seen as 1.1509 to 1.1175. Upside Risks: Above 1.1509 sets a bull trend to aim for 1.1570/1.1621, 1.1815/52 and 1.1996/1.2000. Downside Risks: Below 1.1175 sees a bear trend to target 1.1119, 1.1000 and 1.0839.